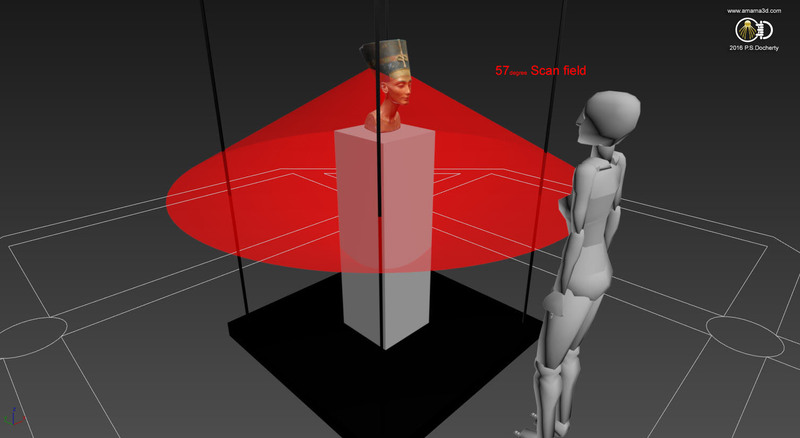 In October 2015 two German artists, Nora Al-Badri and Jan Nikolai Nelles, entered the Neues Museum Berlin and covertly scanned the famous bust of Queen Nefertiti held on display using a Microsoft Xbox 360 Kinect Sensor. The two artists followed this by releasing the processed 3d model data through their website as both an STL (Stereolithography) and OBJ (Wavefront Object) file type for free under the Creative Commons License. On the 27th December 2015 Al-Badri and Nelles spoke at the 32C3 Chaos Communication Congress about the project. You can watch the recorded talk here, although it is in German. 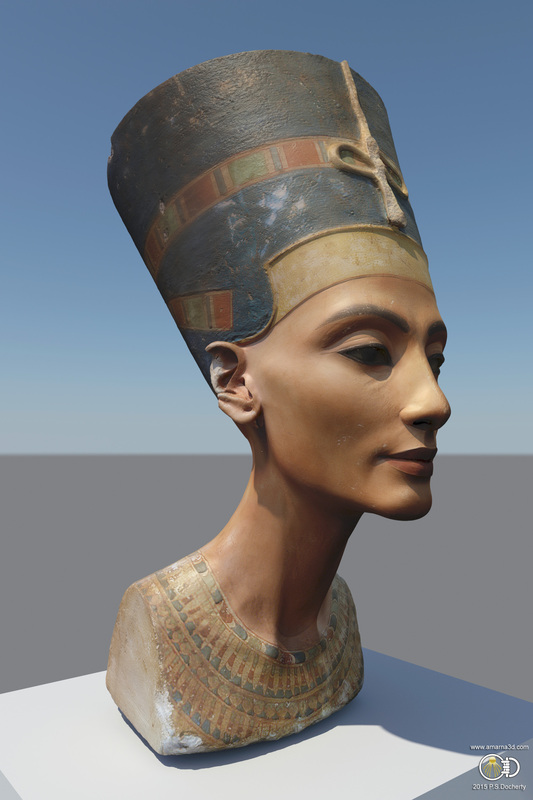 The project has been covered through a number of news articles and some of these have cited my work on the photogrammetric reconstruction of the bust of Queen Nefertiti which I undertook in 2014 and published on this website in February 2015. Some articles have eluded to a collaboration between the two artists and myself, however I can say that as of the time of writing this article I have had no connection with Nora Al-Badri or Jan Nikolai Nelles and I am in no way affiliated with the Neues Museum Berlin. I have since downloaded the 3d data files from the artists website and had a look at the structure of the model and I must admit to having some concerns as to the validity of their claims. I have worked for 30 years in computer graphics and for the most part of this time have been involved in 3D scanning using a wide variety of equipment, some commercial and some developed by myself. The remainder of this article outlines my questions regarding the Nefertiti Hack and may in turn be expanded on at a later date once more information is available. Nefertiti is returning to the place where it was found. For the first time since the sculpture was excavated and stolen over 100 years ago, the iconic artefact will be shown in Cairo. “ “The Other Nefertiti” is an artistic intervention by the two German artists Nora Al-Badri and Jan Nikolai Nelles. Al-Badri and Nelles scanned the head of Nefertiti clandestinely in the Neues Museum Berlin without permission of the Museum and they hereby announce the release of the 3D data of Nefertitis head under a Creative Commons Licence. 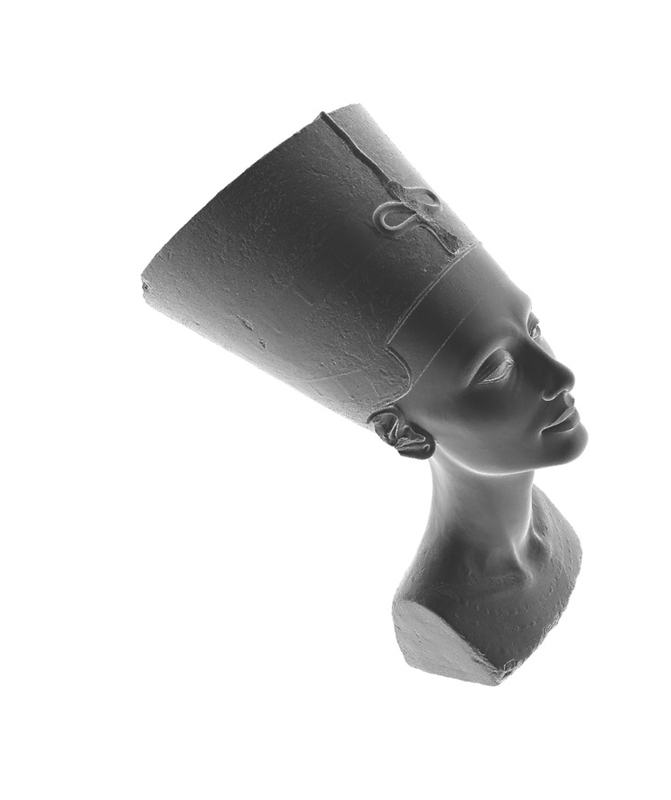 The artists 3D-Print exhibited in Cairo is the most precise scan ever made public of the original head of Nefertiti. With regard to the notion of belonging and possession of objects of other cultures, the artists intention is to make cultural objects publicly accessible. The Neues Museum in Berlin until today does not allow any access to the head of Nefertiti nor to the data from their scan. “With the data leak as a part of this counter narrative we want to activate the artefact, to inspire a critical re-assessment of today’s conditions and to overcome the colonial notion of possession in Germany” the two artists say. 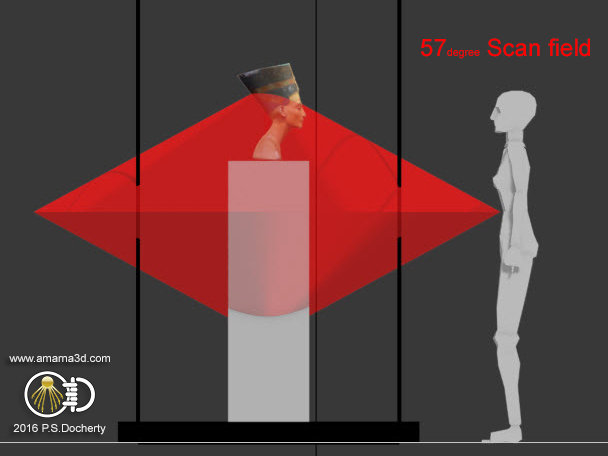 Is the Nefertiti Hack 3D Scan real or fake? Al-Badri and Nelles released a video showing the couple scanning the bust using a Microsoft Xbox 360 Kinect Sensor rotated 90 degrees and strapped to Al-Badri’s torso hidden by a scarf and coat. The video shows her walking around the exhibit periodically allowing the sensor to be uncovered from underneath the scarf in order to ‘scan’ the bust. At one point we can hear a member of the museum staff say ‘no photo’s please’, reinforcing the museums rule on not allowing the public to photograph the exhibits. So given the statements by the artists, the video potentially showing part of the scanning process, and the availability of the actual 3D dataset, can more light be shed on this ‘event’? From the video we can see that Al-Badri and Nelles utilised a Microsoft Xbox 360 Kinect Sensor. In order to make this work as a mobile scanner it would need to be connected to a laptop and use low cost 3D scanning software such as Skanect. The Kinect sensor also needs an external power supply in order to function. A potential solution could be to drive the sensor from a battery pack similar to the ones that charge mobile phones or pads. Unfortunately to get enough power to last for a decent scan time you would need to have a large pack or a number of them daisy chained together. These would be rather bulky to conceal and are quite heavy. A backpack would be the obvious choice for this. The laptop and batteries could be stored in a good load bearing position and cables could be run easily to the sensor. As we can see in the video there is no backpack evident nor any other suitable carrier. Some on-line articles have mentioned that the Kinect scanner was not switched on proving the event as a hoax. The reasoning behind this relates to the video camera which recorded the event not picking up the IR beams from the sensor. Whilst this has some merit, most digital camera equipment has a built in infra-red filter to prevent just this kind of light spoiling a recording. So this cannot be used as a convincing argument towards this event being a hoax. However if a museum were to have cameras without IR filters, situated within an exhibition, then any covert scanning or photography could be potentially spotted. Anyone who has done serious 3D scanning will know of the problems associated with reflective surfaces. Glass is a major problem here. Not only does it distort light as it passes through, but it will cause a lot of bounced light. Look at any photographs of the Nefertiti exhibit and you will see many reflections in the glass. Not just those from Nefertit but also those of the visitors who are constantly moving. This is a major problem for the software to deal with and generally will result in lots of ghosting. The photogrammetric calculations may disregard not just the reflections but the actual subject of the scan. Normally if you have to scan through glass you need to use a polarising filter to remove reflections. The filter would also need to be adjusted for each change in camera position. Again this is not possible with the scanning setup presented within the video. Commercial laser scanners can capture a 3D model in seconds depending on the environmental settings and type of hardware used. In this case the environment is not ideal, but if the scan can be done slowly then the data acquisition may result in a more accurate model. It is uncertain as to how long it took Al-Badri and Nelles to do the covert scan or even if the scan was the result of a number of attempts. It has to be noted that motion will result in blurred images unless the scan is performed at a high frame rate which will in turn result in a more error prone dataset. Just take a look at a still frame from any video. The Kinect 360 sensor shown in the video has a camera resolution of 640x480 pixels and a an angular field of view of 57′ horizontally and 43′ vertically however the sensor is shown rotated through 90′ whilst strapped to Al-Badri. Now this kind of image resolution is very poor if you were using this for normal photography but the Kinect uses the camera to stream video and as such the data has the potential of updating anywhere up to 30 frames per second. A successful photogrammetric 3D reconstruction relies more on the actual coverage rather than the resolution of the source images so a steady stream of data can give good results under optimum conditions. However it has to be said that the resulting surface detail of the Nefertiti Hack 3d model, in my opinion, is beyond the scope of this scanning setup and less than ideal capture conditions. As mentioned already, in order to gain a complete scan you need to have maximum coverage. It is very easy to determine the source viewing angle for each polygon face on the model. Whilst faces can be captured at various inclined angles the model itself can occlude the source viewing angle resulting in a gap in data capture. Anyone who has examined the scan data can see that apart from the underside of the base which is noticeably flat the rest of the model has excellent detail over the whole surface. If there had been any gaps in source viewing angle the software would have tried to interpolate between the open edges using very generic reconstruction algorithms. The resulting surface reconstruction would therefore be devoid of any real detail. This is not evident anywhere on the 3D model meaning that the scan did effectively cover the whole surface, and in detail! The most damning evidence here is the top of the bust. This has the same level of surface detail as does the rest of the model. Looking at the scanning angle required in order to capture this angle it is plain to see that it would be impossible, given the scanning setup used and the height of the scanner strapped to Al-Badri. I know from my own experience in reconstructing the bust of Nefertiti that the top of the headdress is not covered very well by photographers. You would need to either stand well away from the exhibit and zoom in or stand with the camera well above your head. So, where did the data come from? By now readers will notice that I seem particularly biased towards this being a hoax on the part of Al-Badri and Nelles actually conducting a covert scan of Nefertiti’s bust. Whilst I think the evidence does support the event as being a hoax there can be no doubt that the 3D scan they have released to the public is very real. Not only that but the data is very detailed and from what I can gather very accurate. Don’t get me wrong, commercial scanners will produce incredibly accurate models and also very large datasets. If Al-Badri and Nelles had gained access to the scan data from the Neues museum and published it in its raw form then we would be seeing gigabytes’s of data. Al-Badri and Nelles call this the ‘Nefertiti Hack’ which by using the term ‘hack’ implies that they have managed to hack the server holding the original scan data. If that was the case then they would be very naive to think that they could just release it without being found out. So it would make sense to run the data through a polygon decimation algorithm found in most 3D modelling packages and reduce the data in the hope of disguising its origin. The problem here is that all complex meshes can act as a fingerprint and with the right software you can determine the amount of change between an optimised model and the original. Bearing in mind that to maintain its accuracy the model has to retain its original form as closely as possible. This means that some topological structure will be transferred from the original dataset to the optimised one. Even if the model is deliberately distorted in some way there are algorithms which can be used to look at the proportional distances between topographical features and find matches. These methods are similar to those found implemented in facial recognition systems. All it would take would be for the holders of the original scan data to do this with the now publicly available Nefertiti Hack data to establish if the material was hacked from their storage server. If the data was leaked by someone with access to the server then I can understand them disguising it as their own scan project in order to protect their source. I am sure that if the source was to be discovered by the Neues Museum that person(s) would not only face disciplinary proceedings including the termination of their employment but most likely legal action. At this point Al-Badri and Nelles can either sit back and feel secure in the knowledge that they have managed to pull off an incredible feat of technical 3D scanning or be worried that they may be facing charges of theft. Either way I believe that they will need to provide more information regarding their scanning project in the near future. This is a really intriguing event and obviously of great interest to me. My recent photogrammetry experiments to reconstruct the bust of Nefertiti were originally to see if I could construct accurate 3D models from crowd sourced photographic material. Initially I wanted to see if it could be done remotely and, if successful, could it be used to reconstruct artefacts which have been lost to us through various events such as we now see in the middle east. I had planned to do my PhD in the 3D digital reconstruction of Palmyra, however as of the time of writing this article I am still seeking funding in order to see this through. If there is anyone out there who would be interested in discussing this with me then please get in touch with me through my Amarna3D contact page. The release of this dataset has enabled me to see how accurate my photogrammetry experiments were. I have compared my work to theirs and have been pleasantly surprised with the results. I have shown a comparison below. I have also noted how many people have commented on how the model would look textured and due to the accuracy of my model I have been able to re-project my textures onto their high resolution model – enjoy! I applaud Al-Badri and Nelles for making this project and their ideology behind it and I really do hope that they have been honest in ‘recording’ their endeavour. I applaud your observations and insight into the recent Nefertiti hack. I’m only a hobbyist at best but ancient art is my passion. I enjoy photography and have been slowly learning how to use photogrammetry to recreate items that are otherwise unavailable as affordable reproductions. It is a shame that the Kinect shown in the video wasn’t a real, working high-resolution scanner. The implications would have been enormous. With such an inexpensive piece of equipment and some basic training, students, volunteers or nearly anyone could have been put to work scanning the hundreds of thousands (millions maybe?) of items languishing in storage all over Egypt. Not only would it have been a speedy process but it would have helped to ensure the digital preservation of fragile items, created an incredible database of items all over Egypt to protect against theft and best of all it could have been opened to study and access by anyone. Of course, unscrupulous collectors wouldn’t want 3D scans of original items, but the vast majority of people like myself would be more than satisfied in having a digital version of some fascinating and beautiful item from Egypt. I’m sure people would be happy to pay a nominal fee to download a scan of the item of their choice. This would be a win-win for both the public and the Egyptian government. Sadly this event will distract people from the benefits of scanning artifacts and sharing them. Instead, they will be focused on the mysterious origins of this admittedly incredible scan and the possible legal mess it might cause. Museums like the Louvre and Neues that have already created high-quality scans of some of their artifacts and art will use this event as fodder to continue denying access to those scans. Museums that hadn’t already relaxed their stance might become hesitant.